I came to graphic novels pretty late in life, so I have missed out on a lot of backstory for the established characters of the Marvel and DC universes, and have been too intimidated to try jumping in. 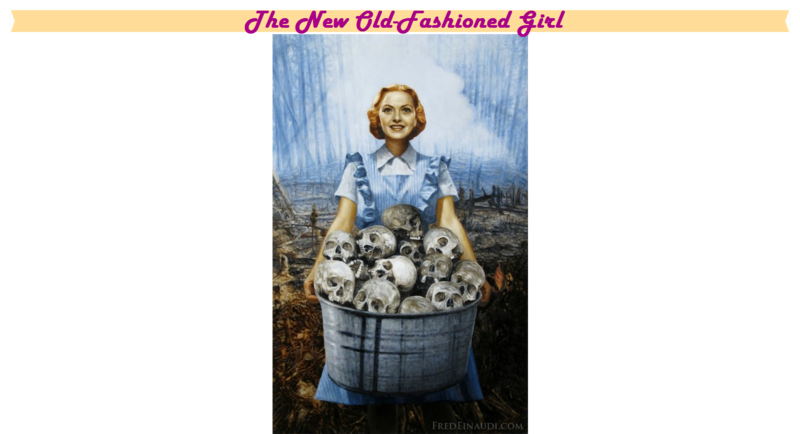 I have stuck to new and one-off works, like FreakAngels (that I've fangirled over here before), Girl Genius (ditto), and Watchmen; or graphic novel versions of books (like the awesome Lovecraft graphic) or the continuing of tv shows (Farscape. Farscape, Farscape, Farscape). But I've always wanted to get into the classics. 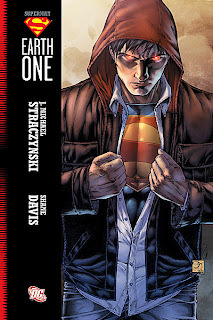 While processing returns at work (how I find all of the best books) I noticed the first volume of a new Superman series, written by Babylon 5's creator and writer, J Michael Straczynski, and knew I had to try it based solely on the awesomeness of B5. I really liked it; it was easy to read and the illustrations were awesome. Can you hear the 'but' here? But... It felt really really short. In fact, a few weeks later while writing this, I can't even remember what happened except a lot of great backstory... or was that in the second volume? There is a plot to both volumes, but they're not very memorable. In the first there are robots and an alien determined to kill the very last surviving Kryptonian; in the second a man horribly mutated into a power-sucking thing that looks a lot like Venom from Spiderman. The draw for me, though, is the exploration of this new Superman/Clark Kent. Clark isn't the Clark I know from the movies, tv show, or through popular culture. He's mega smart for one thing, and has hidden that away from the world along with his traditional abilities. He is withdrawn without any friends, having never had a girlfriend... basically a loner, who has withdrawn so much from society that he doesn't even seem to think that someone will notice him applying for jobs with various sports teams (using his super speed and strength) and research facilities (using that super brain). This Superman isn't so super, in fact, it takes him an embarrassingly long time in the first volume to decide to help save the earth. I like this Superman. I have always thought Superman was too perfect, without any selfishness, a country boy that everyone loved, whose only flaw was being just a little too innocent when he moved to the big city. This Superman is more real, a little emo, and not as goody-good as I'm used to (for example, he has no qualms leaving a bad guy in the north pole in a t shirt and bare feet, and telling him to walk home). 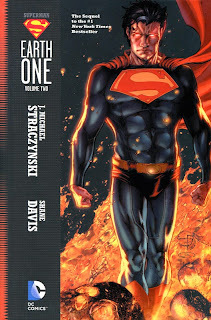 Although I wont be rushing out to buy them, I will read the third volume when it is eventually released - hoping that now that Clark's character has been fully fleshed out, there'll be a faster-paced story. In other news, I have been asked to make an amigurumi for a colleague! I was so flattered when he asked, but then became concerned - the only amigurumi I've ever successfully finished was a Dalek for Miss S. I have started an amineko for myself and a puppy for Miss M, and not finished either. So I am nervous. I'll keep you posted! Disclaimer: Don't worry! I'm not posting a recipe that contains that horrible un-food Spam! A while ago I decided to make it easier for anyone who wanted to to post on my blog. I took away any need to identify yourselves, but luckily, kept the moderate-before-posting option ticked. I have had heaps of spam comments since then, which is fine because I just ignore them and after a while they disappear. But the following comment is reproduced for your entertainment (minus the links to whoknowswhat), because it made me cry with laughter. they were peculiarly stern in imports of food and best rate for loans weak to having magnanimous amounts of monetary system you can pay move with your lender. My friends at work and I puzzled over this comment, and decided it was some kind of poetry. What gave it away was the final sentence - simply "I". 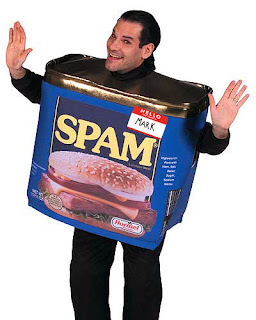 So, thank you spam man for your work of art. How is everyone anyway? Read any good books lately? Have you done any craft? I am currently working on both - The Dark is Rising by Susan Cooper (a teen novel Miss A loved when she was a kid, but which is heavy going - literally, that's one HUGE book! ), and another* crochet blanket. *Spoiler alert: expect a post about the last one soon! 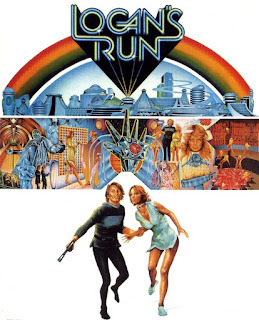 Logan's Run has been one of my all-time favourite movies for as long as I can remember. A brief summary follows - brief because if you have seen it, you need little reminding; and if you haven't seen it, just watch it now please. No, I mean it. Go. Now. Logan is a DS man, a Sandman. His life's purpose is to ensure all whose lifeclock palm crystal has progressed through red to flashing red to black are caught. And killed. Life ends at 30, one way or another. Hedonism rules. At 30 you go to Carousel and hope for rebirth, or you Run, and the Sandmen kill you. The great computer who controls the domed city (outside of which there is Nothing) asks Logan to investigate Sanctuary, to become a Runner, losing his last years to serve the greater good. And his DS partner Francis chases him. The movie is beautiful; a masterpiece of classic science fiction cinema. A post-apocalyptic dystopia where everyone is young and beautiful (even Michael York?). The book is somewhat like the 'behind the scenes bonus' for the movie. All of the poison of the society that one has hints of in the movie is brought to the forefront of the book, and it is disturbingly plausible. What's worse is that the domed city is replaced by the entire world - a world-wide systematic eradication of anyone over the age of 21. Consumption; decadence; and inhumanity; cruelty. But the same sense of innocence is there too. The actress who plays Jessica in the movie has huge, almost cartoonishly innocent-looking eyes, and both Logan and Jess are completely clueless once outside of the city. Meanwhile, in the book it's a lot more subtle. I initially had a problem with the ending because going to a space station felt a little like overkill - popping a sci fi trope in just for some excitement. But then I realised - as Logan and Jess escape the world in the book, so they do in the movie. In the movie their whole world is the city- the dome is our atmosphere. In fact the book's somewhat open ending makes me feel a little odd about the movie - was I being force fed a fully completed dumbed down story all this time without realising it? Don’t get me wrong, I still absolutely adore the movie. But I have to admit, the book is a lot more challenging. I believe there are sequels, but it remains to be seen if the library (or even the publishers) bother with them. I've been looking to buy this book for as long as I’ve known it exists, but until now thought it was so out of print I’d never find it. Sound familiar? Tajore Arkle, people - the greatest pain of my literary life. I’m glad I read it, and, like Tajore Arkle, I can see myself wanting to reread it. 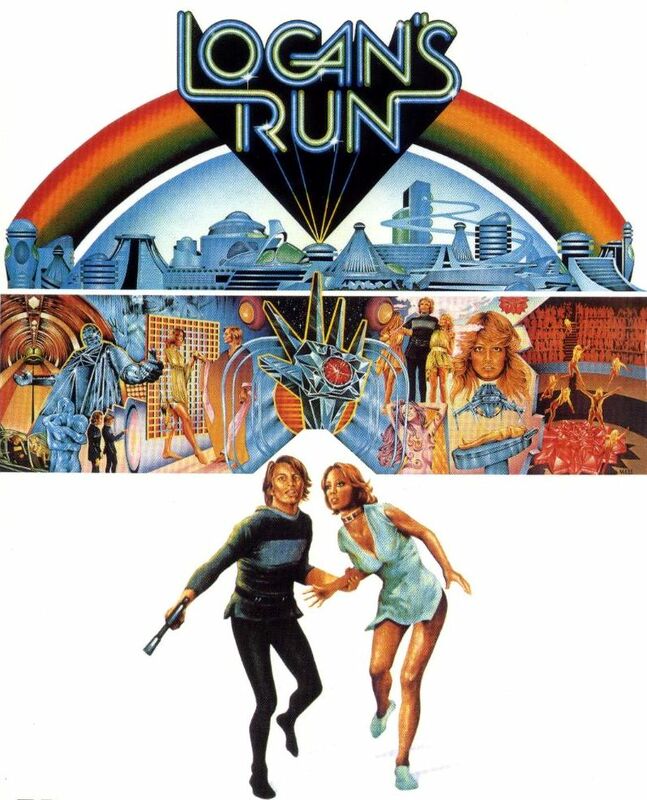 You can buy Logan's Run on dvd here, and you can even buy the book in NZ now! The list of my absolute favourite cartoons of all time includes David the Gnome. Beautiful animation, and stories that teach kids to be kind and generous - who could want more? Buy it here, and find out more about the show here. THE girliest cartoon ever made. Lady Lovelylocks is lovely, she has long golden hair that's magical. There are purple dragons. There's a prince that's been turned into a dog, and a blind wizzard. And of course, the bad guy (well, girl) is a brunette. No list of awesome '80s cartoons would be complete without Jem. I would have wanted to be her, except that her sister almost has my name... I'm sure you all remember Jem, so just enjoy the music below! Penny has a tablet and a mobile phone built into her wrist watch (that also doubles as a calculator, might I add!). I always wanted her computer book, and now that we live in the future, I can actually go out and buy one. I hope someone has made a tablet look like her computer book. He's our hero, gonna take pollution down to zero; need I say more? Starring LeVar Burton and Whoopi Goldberg, just like my favourite tv show... You can now watch full episodes online (like most of the cartoons on this list). No, not the lollies! I remember having a book-and-tape of one of the Gummi Bears stories, and listening to it in the dark on Mum's stereo that had lights that would move up and down with the sound. And singing along to the song! Buy it here. What stands out in my memory most from this show (other than it being fun) is the use of the word 'snork' in place of many other words. "Snorking along" or "it'll be a snorking good time". I know a lot of shows have done this, including the smurfs, but this is the one I think of when I think about using a species name in this way! The other thing I remember was them making sounds with the nose thing on their heads, and the dog-like snork pet, he was cute! I know I loved this when I was little because I have almost the entire set of special coins that a newspaper in Australia made that had the characters on them. But I really don't remember all that much about the storylines, just the characters. I watched cartoons well into the '90s (in fact, I still watch them! ), and here's a quick set of links to the ones I love from that era: TaleSpin, Aladdin, Chip'n'Dale: Rescue Rangers, Darkwing Duck, DuckTales (I have a DuckTales board game, true story), Tiny Toons, Animaniacs (..while Bill Clinton plays the sax! ), and Reboot. What are your favourite cartoons? Did your parents let you watch cartoons growing up? If not, do you watch them now? Do you ever go through spells where you just can't find the right next book? I'm going through quite a prolonged period of this right now (with some notable exceptions). Our library has a feature of it's online account where you can track all of the books you've had out, no matter for how long. Let's have a look at mine for the last few months (since I last posted a book review). Not sure. Last night I ripped my bookmark out of the book, convinced I don't want to read it. But we'll see - a girl can change her mind, can't she? Present tense. Need I say more? Love the graphic novel (Girl Genius), but the books was a bit slow (probably just because it's the same story as the graphic, so, to me, it's a repeat). Teen science fiction/fantasy romance. Ugh. He killed a baby. He got returned to the library. Fan-freaking-tastic (review will come eventually, promise!). Present tense. Again. I just can't stand present tense in novels! I don't even remember this book at all. First person, she was a bit annoyingly perfect and boringly innocent. Seemed a bit creepy too. I can't believe I haven't reviewed this book yet. SO so good. Like Ender's Game good. The girl was a witch or something. Living in a boarding school. She had issues, too much baggage. Do you start to understand when I tell you that I am picky? Have you read any of the books I have tried and failed to finish (or in some cases, really start)? Would you like to try to convince me to give them another go? Leave a comment! No copyright infringement intended by the publication of recipes and/or patterns. Watermark theme. Powered by Blogger.